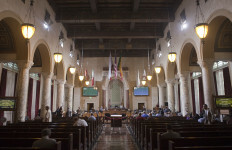 Representatives of the Los Angeles teachers union and Los Angeles Unified School District officials were in an another protracted negotiating session Sunday at City Hall in a bid to end the now weeklong teachers strike, indicating talks will continue into the night and likely into the morning. Sunday’s session started at about 11 a.m., marking the fourth straight day of talks following the United Teachers Los Angeles union’s walkout last Monday. The two sides returned to the negotiating table the late morning of Thursday, following Monday’s walkout. With the mayor’s office acting as mediator, the opposing teams clashed for more than 12 hours before recessing shortly after midnight. Friday’s and Saturday’s bargaining conclaves also began about 11 a.m. and continued throughout the afternoon and evening; Friday’s talks adjourning after more than 10 hours and Saturday’s after about 11 hours, 30 minutes. But with no sign of an deal, the teachers’ union — energized by a downtown Los Angeles rally attended by tens of thousands of teachers and supporters — appeared ready to continue walking picket lines next week. The loss is partially offset — by roughly $10 million a day — by salaries that aren’t being paid to the striking teachers. Beutner estimated earlier this week that the district sustained a net loss of about $15 million on Monday alone.